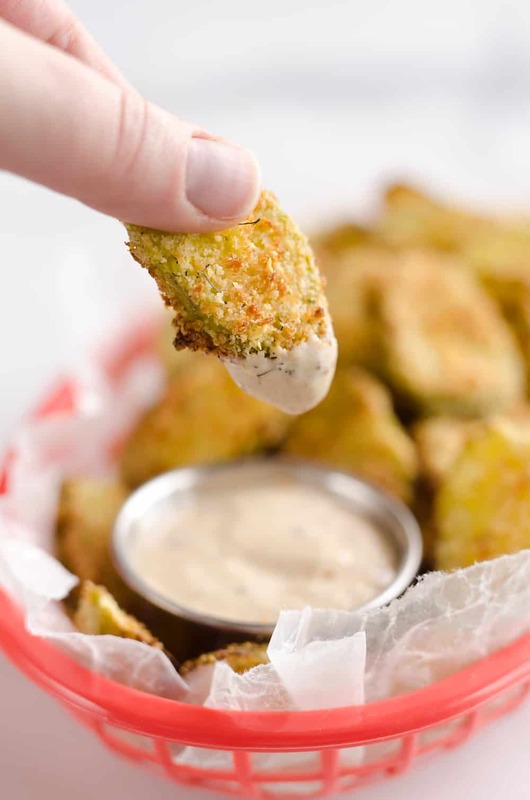 Airfryer Parmesan Dill Fried Pickle Chips are a quick and easy 5 ingredient appetizer made extra crunchy in your Airfryer without all the fat from oil. 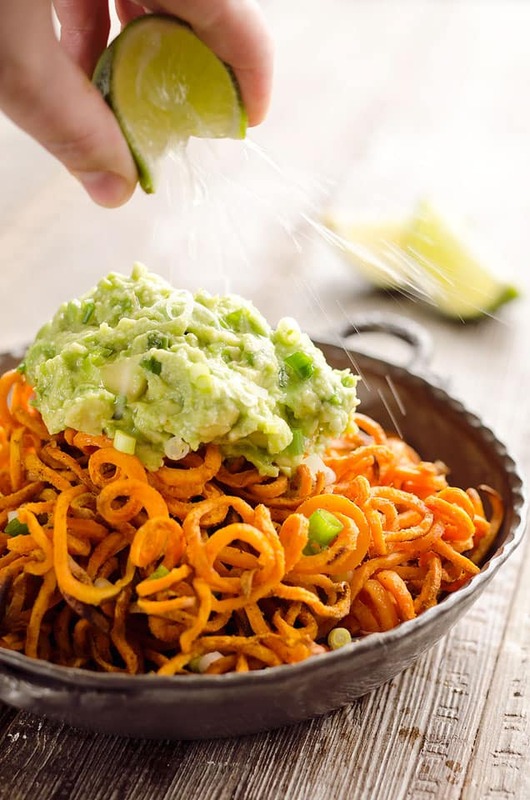 This low-fat snack is sure to satisfy your craving for something salty! 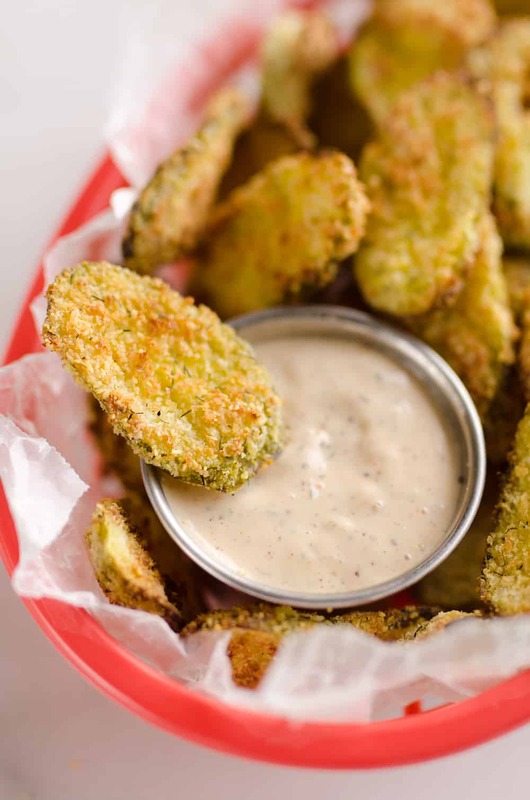 I have tried my own version of fried pickles in restaurants and am almost always a fan. I wanted to make some at home, but I absolutely hate frying things. That isn’t to say I don’t love fried food, I just hate the mess and smell it leaves in my house. Therefore, I defaulted to my handy dandy Phillips Airfryer and made this healthier low-fat snack of Airfryer Parmesan Dill Fried Pickle Chips. I can’t get over how crispy breaded foods turn out in the Airfryer. They are better than baking them which takes twice as long after pre-heating the oven! I convinced my coworker to get an Airfryer of his own and upon receiving his new gadget, he quickly put it to the test. He prepared some Gold’n Plump SHAKERS and homemade fries. He baked half of each in the oven and prepared the other half in the Airfryer. He excitedly shared that the chicken and fries in the Airfryer turned out much quicker and most importantly crispier! I have subsequently purchased my Mom and sister an Airfryer. My Mom then bought my sister-in-law an air fryer. Needless to say, everyone who gets one is a big fan! I want to be fully transparent and let you know that this is in no way an advertisement for Airfryers. I just have to share my love of them with you, because I think they are such a wonderful invention. 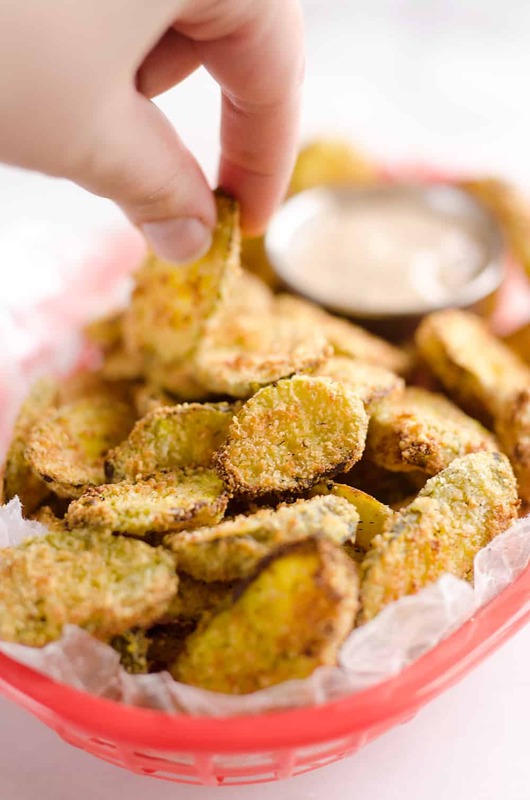 Whether I am making up these Airfryer Parmesan Dill Fried Pickle Chips or just tossing a grilled cheese or burrito in it, they are so quick and easy, it is a must-have for convenience. 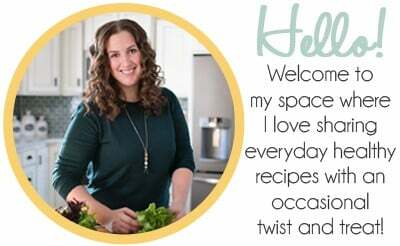 I personally own the Phillips brand Airfryer and recommend it to anyone who will listen. I can’t speak to the quality of other brands. If you are looking for a good deal, you can always check eBay for refurbished Airfryers that you will find for about half the price of a new one. 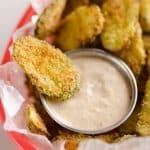 These homemade pickle chips are easier to make then you would think. They require only five simple ingredients and come together in less than 30 minutes. To get started, you will want to slice large dill pickles into 1/4″ thick slices and place them on a layer of paper towels. Pat them dry so the breading will stick to them nicely. Next up, in an assembly line fashion, dip each pickle into the egg wash and then in a mixture of panko bread crumbs, dried dill weed and Parmesan cheese. If you have an XL Air Fryer, you can cook them all in one batch. If you are like me and using the smaller version because you are only cooking for two, then you will want to cook these in two separate batches. Another option is to utilize a double rack for your smaller Airfryer. This allows the hot air to crisp up larger batches like this recipe in just one run. Slice the large pickles diagonally into 1/4" thick slices. Place between layers of paper towels and pat dry. In a shallow bowl, beat the eggs until smooth. In a resealable bag, add the Panko bread crumbs, Parmesan and dill weed and shake until well combined. Add half of the coated pickle chips into the Airfryer and bake for 8-10 minutes on the highest temperature. Remove from the Airfryer and add the remaining pickle chips and bake for 8-10 minutes. Serve immediately with zesty ranch for dipping. NOTE: If you own a larger XL Airfryer, you can cook all the chips in one batch. After seeing this, I’m not sure I can put off buying an air fryer any longer. 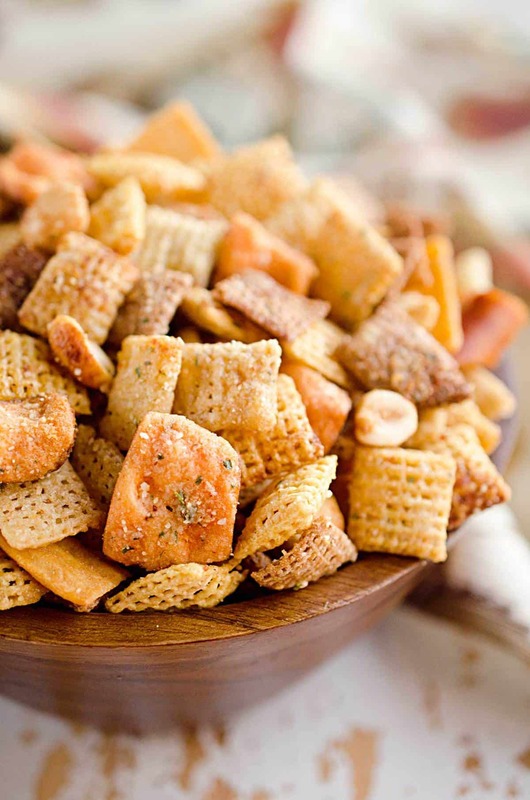 These look SO good, and I so wish I had a big basket in front of me right now! Gotta try these! get you an air fryer, the best thing I ever did we can still enjoy some of the NO-NO’s with air fryer Meat cook so awesome in it , my husband is a diabetic and the air fryer saves me from fighting with him about what he eats because I still can let him have some of his favorites food with out all the grease. Hi Rebecca .. if your husband is type 2 please let him eat all the healthy fats … fry things in bacon grease .. avocado oil .. lard … if you have not had a look thru the internet yet about Keto diet .. his diabetes can be cured .. Have a look at Dr Ken Berry on utube ..
You can not CURE diabetes!!!! You can keep it under control with no medications, but once you have it you are always s diabetic no matter what your glucose readings are. Educate yourself before making comments! Can’t wait to try this recipe! Any chance you can share the recipe for the dipping sauce? Perhaps I missed that! These pickle chips look so delicious. 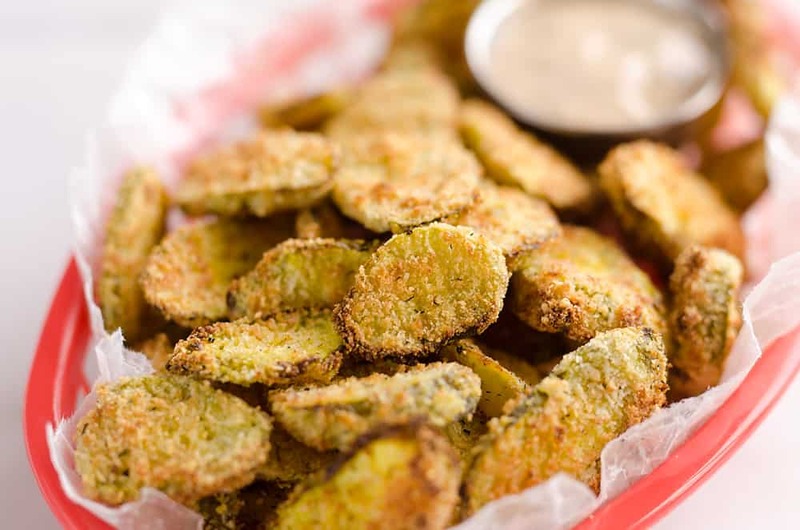 I love fried pickles and add that with some parmesan and its a win! Thank you for sharing! Did you spray them in the air fryer with cooking spray? I used to spray everything in the Airfryer with cooking spray but I have found that it doesn’t make much difference in texture at the end of the day. I just received a Philips air fryer for Christmas and am excited to get to work. What temperature do you set it to? I cook at the highest temperature available, which on the Phillips is 390°. Do they have to be single layer ? I’ve learned that you don’t have to stack things in a single layer for the airfryer to work well. I wouldn’t do more than two layers though with these or they will start to clump together. My bread crumbs keep falling off! How do you get them to stick better? After crumbing, refrigerate for 30 mins before cooking to prevent crumbs from coming off. Also make sure you pat the pickles dry before breading or it won’t stick well. I am also new to air frying, still learning. Would appreciate more air fryer recipes if you got ’em! Thanks! Can you do these with spears? I haven’t tried them, but I would think it would work just as well. Do you turn these over halfway through the cooking time? Are these made with fresh Parmesan cheese you would find in a tub in the deli, the kind in a bag in the dairy department or the kind in thce green cylinder made by Kraft? 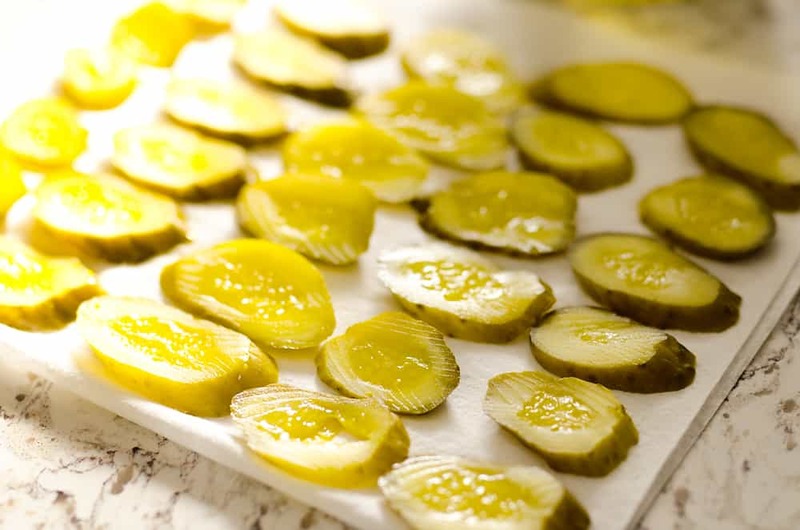 Could you use pre-sliced dill pickle chips by Vlasic or another brand? I used the shelf stable Parmesan (green can) and any pickle should work! Just made these! I didn’t have dill spice but didn’t need it. They were SO GOOD! I had smaller whole pickles so by the time it was done preheating (with pickles in) they only needed to cook 4 minutes and they were done! I served with spicy ranch! Only complaint is I wish I had made more! I had to keto-fy these – and it was SO WORTH IT. OMGosh these were to die for! They’ll become a regular at our house. Instead of Panko I used Almond flour and for dip I mixed sriracha mayo and sour cream. I cooked themon the actifry mesh tray – they turned out perfect – couldn’t get enough of them… Thanks for the recipe! Happy you were able to make them work on keto! This is perfect for game day!! Love how easy this appetizer is to make! 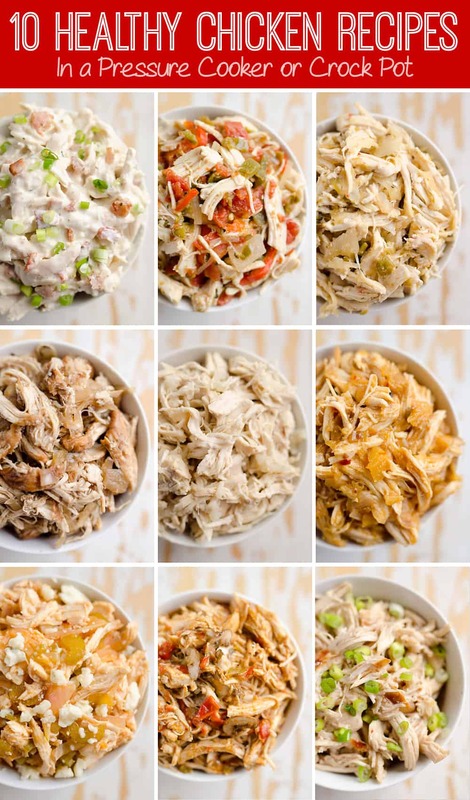 They will be perfect for game day snacking! These look delicious. 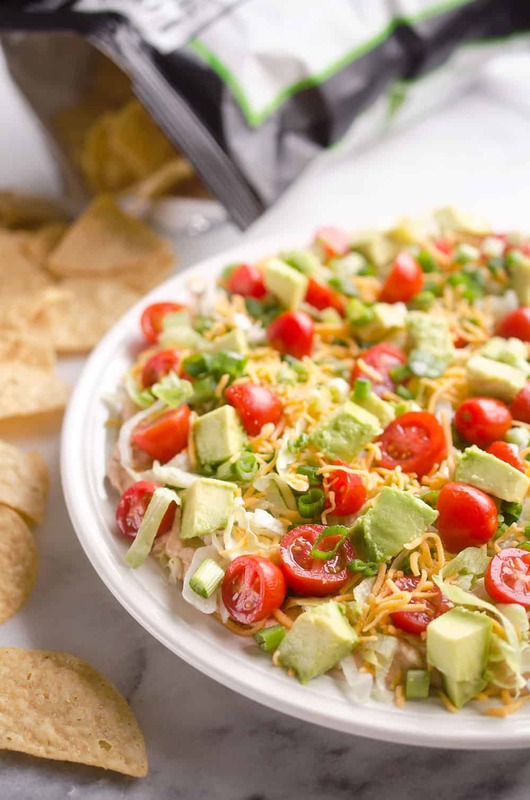 Do you have a recipe for the zesty ranch dip you serve these with? I don’t see it on your site. Thank you. I just bought the Hidden Valley zesty ranch!